After notching a tepid growth rate in the prior quarter, the Bundesbank's warnings that the economic engine of Europe faltered during the third quarter have proved accurate. In what was its worst GDP print in three years, Germany saw its economy contract 0.2% in Q3, putting Europe's strongest economy on the bring of a technical recession and providing the clearest sign yet that economic growth in the euro area stalled just as the ECB was preparing to end its massive bond buying program with an eye toward raising interest rates late next year, according to Bloomberg. While the hope is that the setback is related largely to new emissions tests that temporarily disrupted car production, the data will feed into fears that the euro area’s expansion has faltered as the Continent faces down risks including Italy's confrontational populism, the looming Brexit, and the ongoing US trade conflict (which threatens to hammer the German auto industry if Trump changes his mind and decides to pursue tariffs). But analysts have found at least one scapegoat to blame the contraction: according to Bloomberg, Germany's economic ministers hope the contraction was largely driven by new emissions tests that temporarily disrupted car production. Data from the VDA German carmakers’ association appears to bear that out, as the agency said September production plunged 24% compared with a year earlier. At least one analyst said they expect auto production to rebound, as a second quarter of declining growth would be "highly unlikely" especially as that would put Germany in a recession. "The good news is that the economy will expand at a decent clip so long as auto output doesn’t take another leg down - and that’s highly unlikely. We expect a material rebound as industrial production picks up a bit further through the quarter." 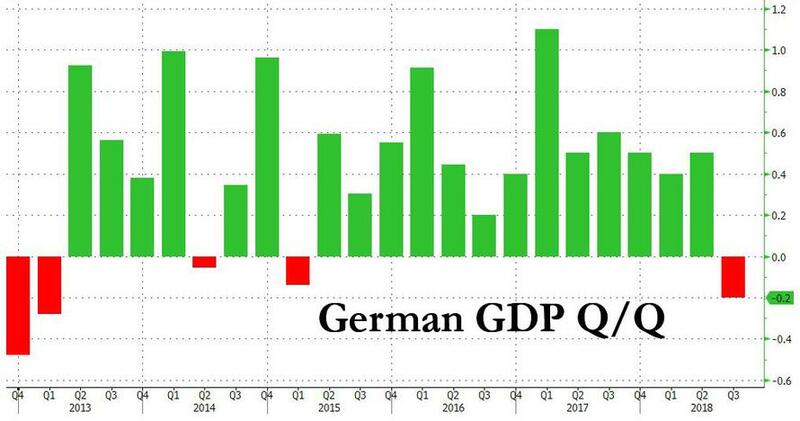 Germany's Economy Minister Peter Altmaier echoed that view during a speech in Berlin, saying the GDP figures were "not particularly pleasing but were also not a secret," and that it's no catastrophe, we had similar numbers in 2015." If anything, the data showed us that the expansion "is a tender flower" that must be protected (the implications of which, we imagine, were not lost on Draghi). "All experts say that the expansion will continue." "But it also shows that an expansion is a tender flower and that we have to work to make sure it continues." Germany's statistics office doesn’t offer a detailed breakdown of GDP but it did say that exports and private consumption both dropped last quarter while equipment investment and construction rose. The poor print out of Germany was expected to weigh on growth later in the year. The third-quarter weakness in Germany dragged on the euro area, with data later on Wednesday forecast to show its economy expanded at the weakest pace since 2014. While the ECB has already downplayed the loss of momentum, a year-end revival isn’t assured. Germany’s manufacturing sector - which accounts for almost a quarter of economic output - may feel the pain of trade tensions and China’s slowdown. So far, at least, the ECB is choosing to see this as a one-off. But if tepid growth persists for another quarter, the market could begin repricing expectations surrounding a late-2019 rate hike. Any signs of persistent weakness in Germany, which accounts for a third of the euro area economy, would play into the thinking among ECB policy makers as they complete their exit from three years of large-scale bond-buying. But Chief Economist Peter Praet said while there’s been a slowdown in the euro area, domestic demand remains "robust." "Fluctuations in the data can’t hide the fact that the economic upturn in Germany and the euro area remains intact," Bundesbank President Jens Weidmann said on Wednesday. Germany's economic ministry is calling for a return to growth in the fourth quarter. "Indicators for manufacturing and the overall economy, as well as the development in the export environment, underline" a return to growth in Q4. But as auto sales in China and the US weaken, Germany's production delays might also mask the fact that the underlying global demand for German cars has diminished.